The Blue Sea Hotel Apartments have parquet floors and simple wooden furnishings. Each is spacious with a seating area and a well equipped kitchen. They come equipped with air conditioning and a safe. In the morning, the hotel serves a Continental breakfast. There is also a pool bar serving a variety of drinks, cocktails and snacks. Wi-Fi is available throughout the hotel in the public hotel areas. 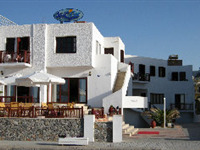 The staff at the Blue Sea Hotel Apartments are available 24/7 and can help guests with tours and area information. Public parking is possible close to the hotel.